Sugar Bowl Preview: Can Cardale Jones and Ohio State hang with top-ranked Alabama? NEW ORLEANS -- As if the historic game, iconic programs and do-or-die stakes weren’t enough, the Sugar Bowl offers this season’s marquee coaching matchup. Alabama’s Nick Saban and Ohio State’s Urban Meyer could well be remembered as the defining college coaches of this generation, and it’s delicious serendipity that they’ll match grimaces on the sidelines of the first College Football Playoff. 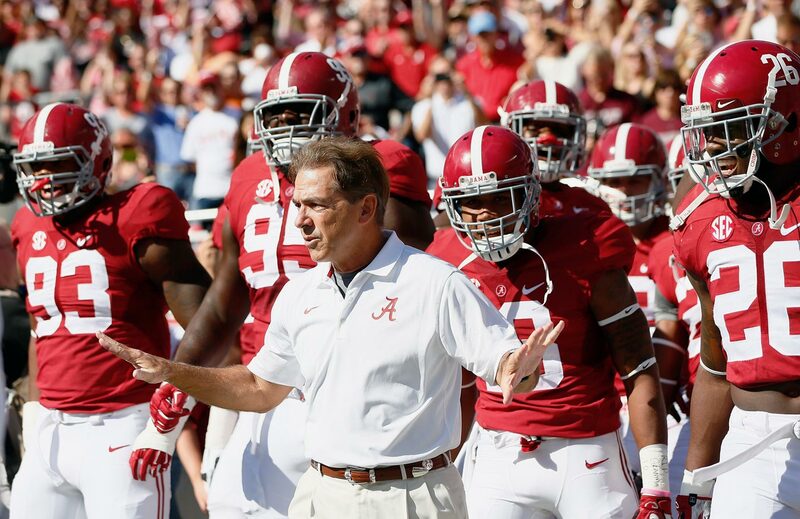 Saban’s top-ranked Crimson Tide (12-1) enter the game as 10-point favorites. They boast a dazzling array of skill players like wide receiver Amari Cooper and tailbacks T.J. Yeldon and Derrick Henry, who complement a typically suffocating Saban defense. Meyer’s No. 4 Ohio State (12-1) team delivered a haymaker to reach the playoff by unexpectedly routing Wisconsin 59-0 in the Big Ten title game. The Buckeyes have superior offensive and defensive lines, but a looming question mark under center, with Cardale Jones making his second career start. Will Meyer be able to sneak by his nemesis with a third-string quarterback? Will Saban and offensive coordinator Lane Kiffin -- another Meyer nemesis -- be able to continue their up-tempo march? There are major questions for a game where the hype, stakes and stars have aligned perfectly to create an epic matchup. 1. Joey Bosa: When Meyer came to Ohio State late in 2011, his plan was to bring an SEC-style team to the Big Ten. It worked resplendently, and nowhere is that more evident than on the Buckeyes’ defensive line. Bosa, a true sophomore, is arguably the country’s best defensive lineman and could end up as the caliber of player who draws No. 1 NFL draft pick buzz next year. Bosa is a unanimous first-team All-America, finishing the season with 13.5 sacks and 20 tackles for loss. Right tackle Austin Shepherd’s ability to contain him will be the most important matchup of the game for Alabama. The offensive line is the Crimson Tide’s relative weakness, which means Bosa and star tackles Michael Bennett and Adolphus Washington will need to put constant pressure on quarterback Blake Sims. 2. 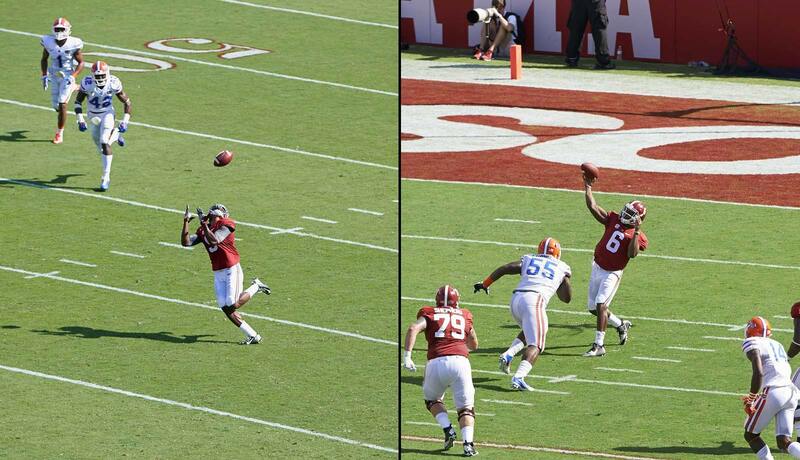 Amari Cooper: He is the most dynamic skill-position player in college football this year, hands down. Cooper projects as a top-five NFL draft pick, as the true junior dominated the SEC this fall. He caught 115 balls for 1,656 yards; the SEC's second-leading receiver, South Carolina’s Pharoh Cooper, had 1,136 receiving yards. Cooper can hurt Ohio State in a variety of ways, as Alabama splits him wide, lines him up in the slot and occasionally gives him touches on runs. Ohio State cornerback Doran Grant could end up spying Cooper, much like he did successfully against Michigan State’s Tony Lippett in the Buckeyes’ 49-37 win over the Spartans on Nov. 8. Ohio State is haunted by memories of its porous secondary from last season’s Orange Bowl, as Clemson’s Sammy Watkins eviscerated it for 16 catches, 227 yards and a pair of touchdowns in the Tigers’ 40-35 win. Cooper has that type of talent, so he will provide a fascinating litmus test for how much the Buckeyes' secondary has improved in a year. Yeldon led the Tide with 932 rushing yards on 184 carries, but Alabama has been judicious in his use as the season has worn on. For instance, he carried the ball just 14 times in the SEC title game. But with the Sugar Bowl projecting as a game where field position and special teams will prove vital, look for Yeldon to carry a heavy load, especially if the Tide find success against Ohio State’s stout front four. Can Cardale Jones channel the same magic he flashed against Wisconsin? Jones made his first career start in Ohio State’s Big Ten title game blowout, and thrived. His lack of game-changing mistakes was just as impressive as his final numbers: 12-of-17 passing for 257 yards with three touchdowns. Can Jones have the same success against the Crimson Tide? He likely won’t be able to throw over the top as often, as Alabama brings a different caliber of defensive back than Wisconsin. Bama also brings the country’s No. 4 scoring defense (16.6 points per game), and Buckeyes offensive coordinator Tom Herman said he has never seen a defensive line with the size of Alabama’s. Saban will try to flummox Jones and prevent him from getting into a groove. Alabama punter JK Scott: Scott ranks second nationally with an average of 47.0 yards per punt, bookending his season with a 62-yard punt against West Virginia in the opener and a 70-yarder in the regular-season finale against Auburn. He pinned two punts inside the five-yard line against Mississippi State on Nov. 15 and could make a huge difference against Ohio State on New Year's Day. Get used to his name -- he’s only a freshman. 161.9: Perhaps the most impressive number from Alabama’s sparkling season is Sims’ pass efficiency rating. His 161.9 mark ranks No. 7 in the FBS, ahead of stars like Dak Prescott, Brett Hundley and Connor Cook. Sims staying efficient and turnover free will be the key for Alabama. It’s really that simple. Expect a low-scoring affair in which field position and special teams become huge factors. Jones played essentially without error in Ohio State’s 59-0 victory over Wisconsin, which brought the country’s second-ranked total defense into the game. It’s hard to envision him performing the same way here, especially with Bama’s front seven likely stopping the run and getting more pressure in the backfield. Look for Alabama to win, as Ohio State is still a year away from competing with the high-end SEC heavyweights. Kiffin will find creative ways to get Cooper the ball, and Sims should do just enough to pull away. Sims has evolved from a caretaker into a playmaker who can pick up necessary first downs and exploit Ohio State’s suspect secondary. 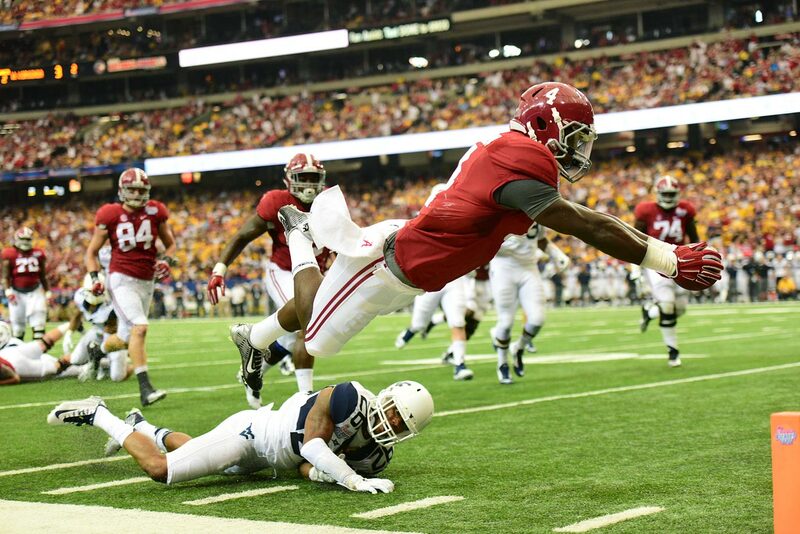 A healthy Yeldon will be tough to stop, too, even for the Buckeyes’ stout defensive line. The Crimson Tide won a closer-than-expected opener thanks to a big performance from running back T.J. Yeldon, who rushed for 126 yards with two touchdowns. Bama blanked the Owls in a game called early because of lightning. 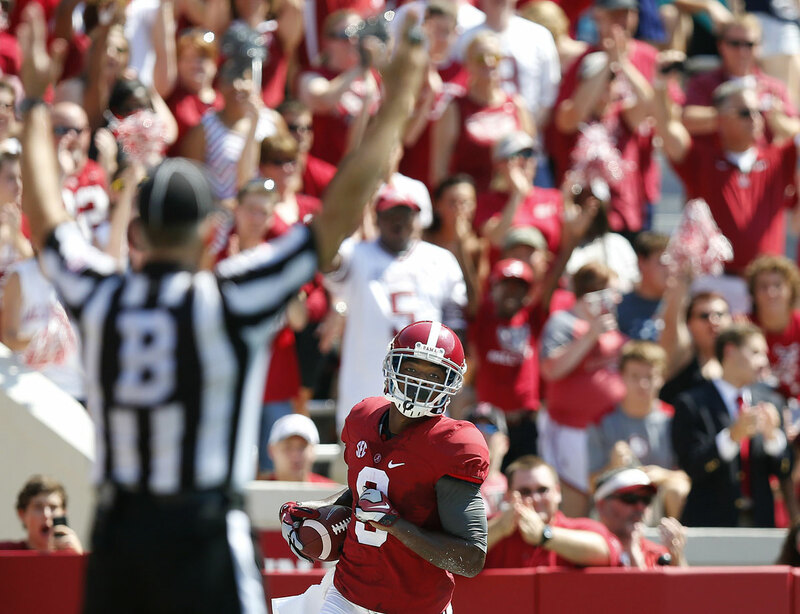 That didn’t stop Amari Cooper from going off: He had 13 catches for 189 yards and a touchdown. Alabama woke up from a slow start behind a breakout effort from quarterback Blake Sims, who went 12-of-17 passing for 168 yards with two touchdowns. 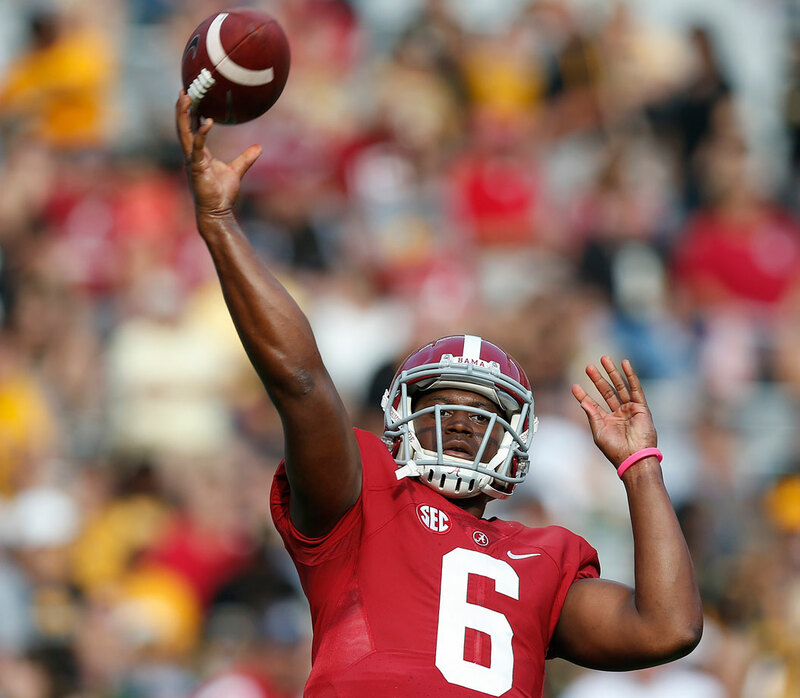 Despite being tied at 21 in the third quarter, Alabama rolled to an easy victory. 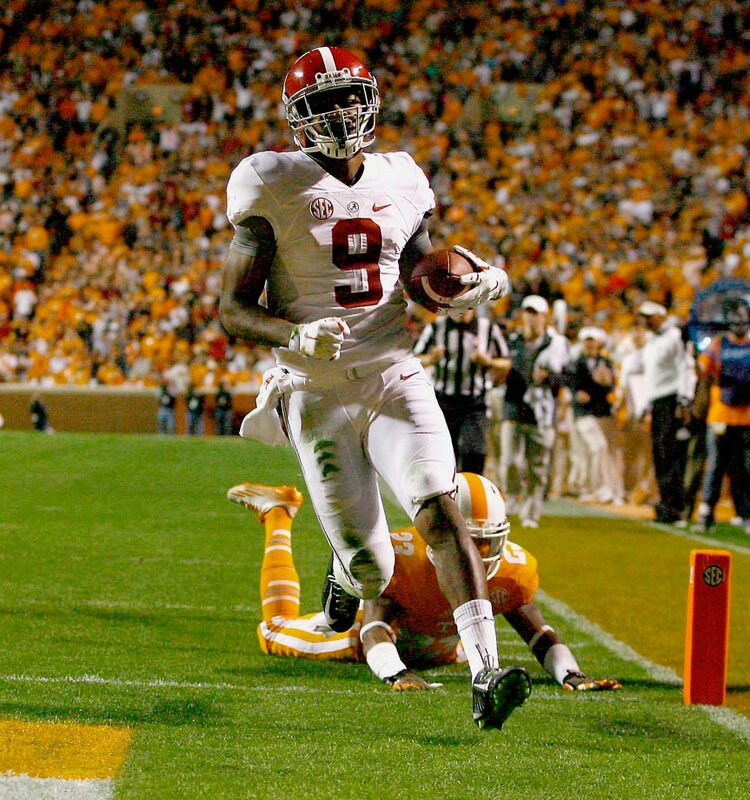 The Tide rattled off 21 unanswered points behind Sims and Cooper, who connected 10 times for 201 yards and three touchdowns. The Tide took their lone loss in the season in Oxford, Miss., where the Rebels rallied from an 11-point deficit to win. 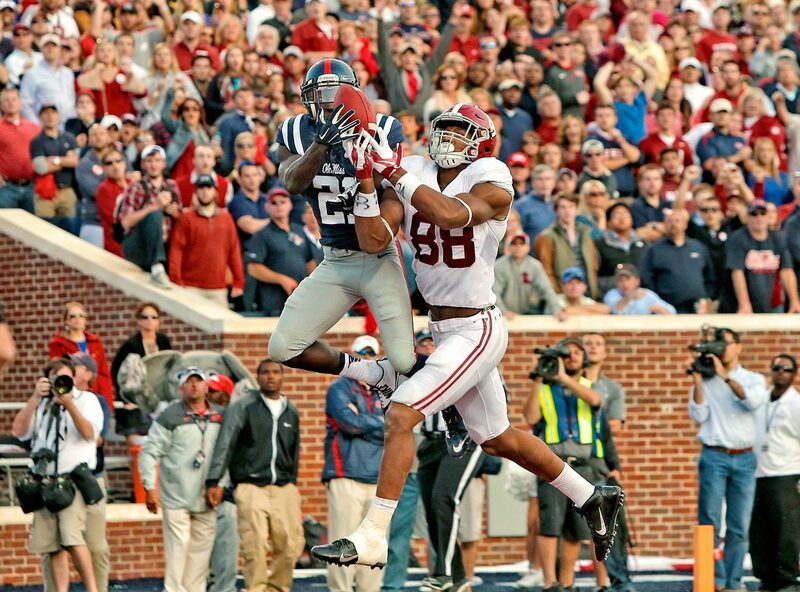 Alabama’s last-gasp effort fell short when Ole Miss cornerback Senquez Golson intercepted Sims’ fourth-quarter pass. 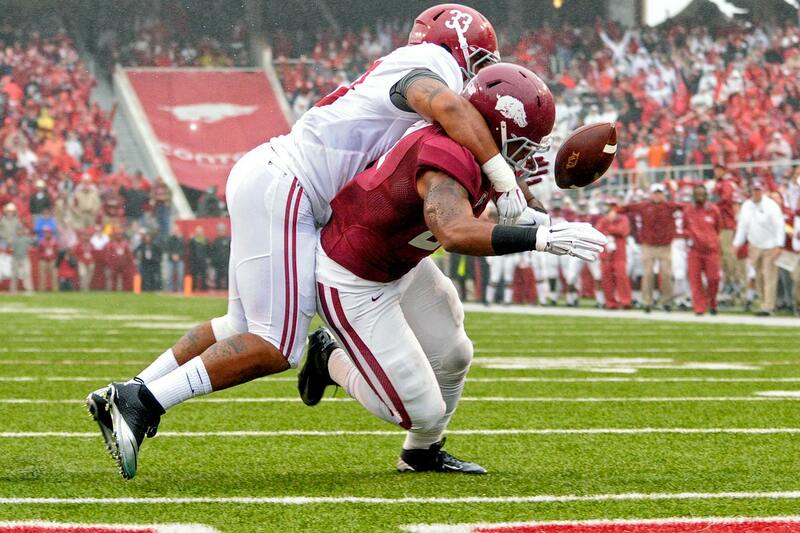 It wasn’t pretty, but Bama held off Arkansas to avoid consecutive losses. Trey DePriest forced a key fumble in the first quarter, and Landon Collins made a crucial interception in the fourth. This one was over in a hurry. 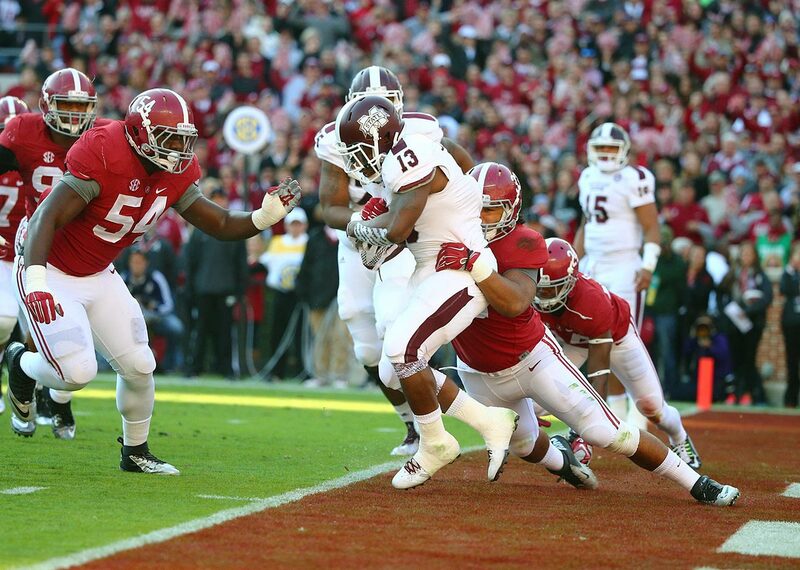 Alabama obliterated Texas A&M behind a second-quarter onslaught in which the Tide scored 35 points. It was the first time the Aggies were shut out since 2003.
Cooper continued his stellar 2014 season in Knoxville, Tenn. Alabama’s star receiver opened the scoring with touchdown grabs of 80 and 41 yards and finished with 224 yards on the night. The Tide seemed dead when LSU had the ball at the six-yard line and 1:13 to go in a 10-10 game. 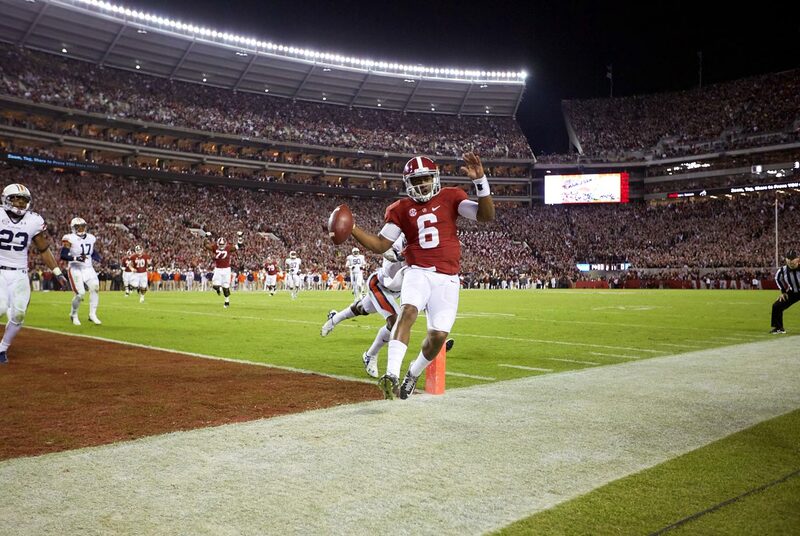 But the Tigers settled for a field goal, and Bama evened it up with three seconds left. Sims hit DeAndrew White for the game-winning score in overtime. Alabama handed Mississippi State its first loss thanks to a dominant performance from the defense. Bama opened the scoring with a safety and kept the Bulldogs out of the end zone until early in the fourth quarter. 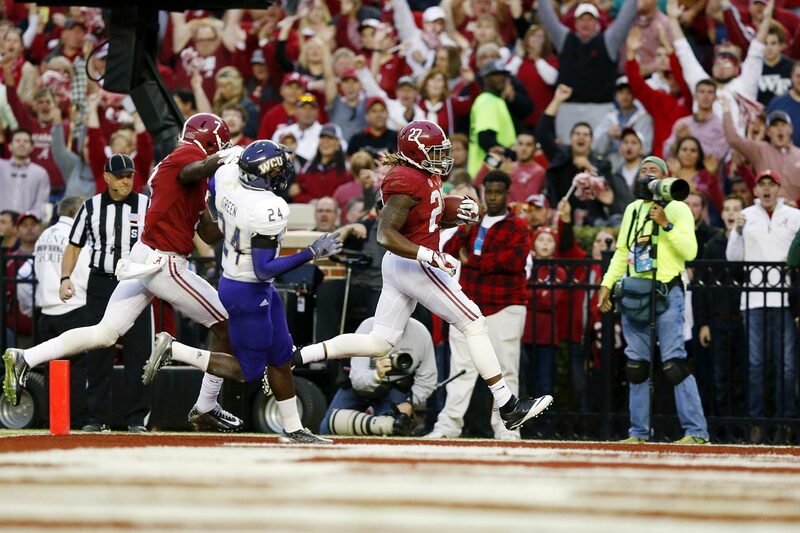 As expected, Alabama stomped FCS-level Western Carolina. Running back Derrick Henry was the difference-maker, scoring two touchdowns in the second quarter and finishing with 12 carries for 92 yards. Auburn seemed in position to upset the Tide after taking a 33-21 lead early in the third quarter. 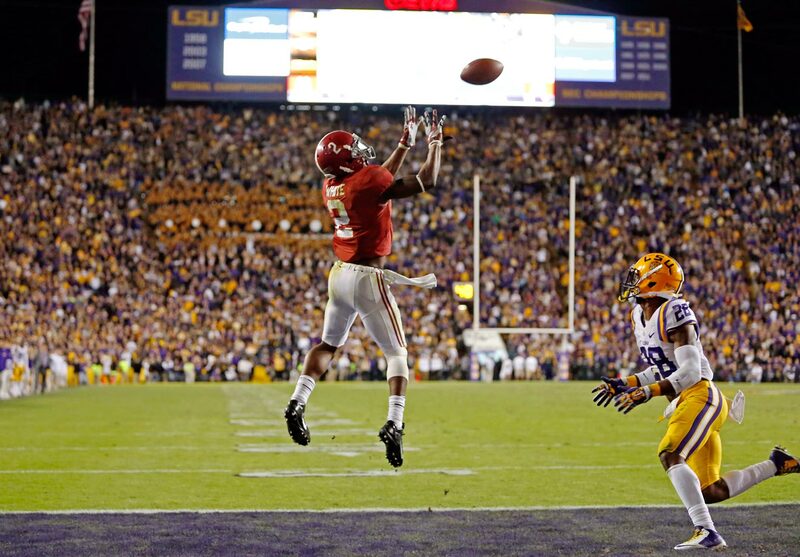 But Bama hung 34 second-half points to keep its College Football Playoff hopes alive. Sims was the star: He went 20-of-27 for 312 yards with four touchdowns and three interceptions, and rushed for 23 yards with a score. There was no drama in the SEC Championship Game: Alabama raced out to a 14-0 lead and never looked back. 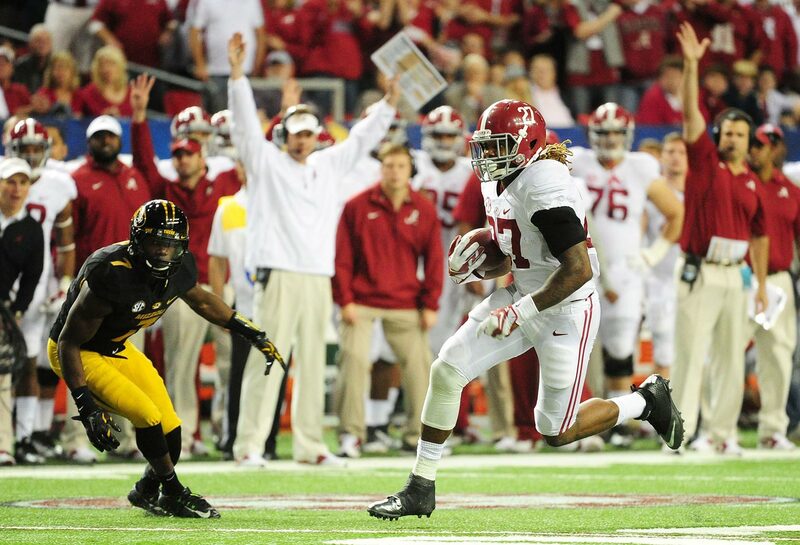 Henry and Yeldon both found the end zone twice as Alabama secured a spot in the Sugar Bowl.